SANTIAGO, Mar 11 2014 (IPS) - For the past four years, the foreign policy of Chile, South America’s “miracle”, has focused more on economic than political issues. Socialist Michelle Bachelet, sworn in this Tuesday Mar. 11 for her second (but not consecutive) term as president, must now recalibrate those policies, which have scored some successes but have also sparked tensions and conflicts. 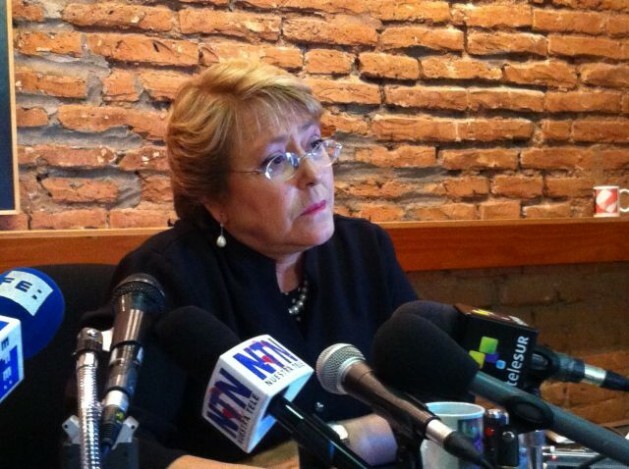 During her election campaign, Bachelet said the foreign policy of the outgoing president, rightwing Sebastián Piñera, had a “mercantile emphasis,” and promised she would employ a more political approach. Her government programme contains a harsh critique. “Chile has lost presence in the region, its relations with its neighbours are problematic, a commercial vision has been imposed on our Latin American links, and external integration options have been ideologised,” the programme says. Chile fought against the adjacent countries of Bolivia and Peru in the War of the Pacific (1879-1883) in which an estimated 14,000 to 23,000 people were killed. The embers of the conflict are still very much alive, especially in Bolivia and Peru, which lost significant amounts of territory to Chile. Peru lost what is now the Chilean region of Tarapacá, and Bolivia lost what is now Antofagasta, as well as its access to the Pacific ocean. Chile and Bolivia broke off diplomatic relations in 1978 and the tension between them continues, due to Bolivia’s demand for the recovery of its outlet to the sea. During the Piñera government, “which had less political talent and lacked a narrative,” discourse on Chile as an economically and commercially successful country was emphasised, something that had been present in its foreign policy since 25 years ago, Quiroga, a professor at the Diplomatic Academy, told IPS. Bachelet (2006-2010) has ample political capital in the region and in the world, which was enhanced by her role as executive director of U.N. Women. In her last international appearance as the president of Chile, at the 21st Rio Group Summit in Mexico in 2010, Bachelet’s leadership qualities were evident in her speech, which received an enthusiastic ovation. “You can count on Chile, today and tomorrow, to work for our continent and for our Community of Latin American and Caribbean States (CELAC). You can always count on today’s president of Chile, who will always be a woman of Chile,” she said. She is also close to Argentine President Cristina Fernández, who calls her a “dear friend,” and is on good terms with Ecuadorian President Rafael Correa. Piñera, in contrast, was closer to Colombian President Juan Manuel Santos, and promoted the Pacific Alliance which also includes Mexico and Peru, seeking to create a free trade area, boost economic competitiveness and become a platform for exercising influence, especially in the Asia Pacific region. Fundamental aspects of Piñera’s foreign policy “were subordinated to certain commercial and economic interests,” political scientist Fabián Pressacco, of the Universidad Alberto Hurtado, told IPS. However, Piñera denies that his government neglected regional political, social and cultural issues. “That does not correspond with reality,” he told IPS during a press conference with foreign journalists. The emphasis on the Pacific Alliance, created in 2011, “did not mean that we neglected the continent,” Piñera said. His government worked for global integration and promoted “wider strategies that included political, social and cultural aspects,” he added. And it participated actively in mechanisms like CELAC and the Union of South American Nations (UNASUR), among others, Piñera said. But according to Quiroga, his handling of foreign policy has created some urgent challenges. The first of these is strengthening relations with Argentina, Bolivia and Peru, the countries with which Chile shares borders. Next, “a long-term working agenda should be established, to strengthen Latin American integration, in which relations with Brazil, Ecuador and Mexico should be secured by means of a strategy of public policies and not only commercially motivated actions,” said Quiroga. Bachelet has nominated distinguished diplomat Heraldo Muñoz, a former ambassador of Chile to the United Nations and a high official of the United Nations Development Programme (UNDP), as her foreign minister. Muñoz will have to address the ongoing conflicts with Peru, which Piñera dealt with by a policy known as “cuerdas separadas” (separating commercial issues and territorial disputes as “separate strings”), maintaining relations almost entirely on the commercial plane, while the International Court of Justice (ICJ) debated a bilateral maritime dispute. BOLIVIA-CHILE: How Close Is the Sea? The new foreign minister will also have to face problems with Bolivia, a country with which Chile broke off diplomatic relations in 1978. Bolivia took its claim for a sovereign outlet to the sea to the ICJ in The Hague in 2013. In spite of the tensions and exchanges of words with Piñera, Bolivian President Evo Morales decided to attend the handover ceremony, and his vice president, Álvaro García Linera, announced he would visit Chile at the end of March as a gesture of “rapprochement,” his advisers told IPS. With Bachelet as president, relations with Argentina will also be smoother, analysts say. Ties with Argentina have been strained by the political asylum granted by Buenos Aires to Galvarino Apablaza, a former guerrilla prosecuted in Chile for the 1991 murder of rightwing senator Jaime Guzmán, and by a dispute between the Chilean airline LAN and Argentine airport authorities. “UNASUR should become a point of convergence for integration initiatives in South America, while CELAC should be a platform for political coordination in the region,” says Bachelet’s government programme. “In the Bachelet government, Latin America is going to be more important in a wide sense, and not just in the commercial-ideological dimension given it by the Piñera government,” Pressacco said. Delegates from more than 20 countries will be attending Bachelet’s investiture, including nearly all the region’s presidents.